Wow! 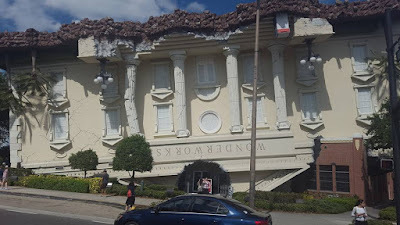 I literally don't know where to begin with Wonderworks Orlando, we had such a fantastic time here, that we were really disappointed when it came to having to leave. Located on International Drive, you can't miss it when driving past as the outside is presented as an upside down house. It is so clever, and immediately attracts your attention. We couldn't wait to get inside and find out what it was all about! The Wonderworks website describes the experience as being one of the top things to do in Orlando and they are not wrong. This indoor attraction offers 35,000 square foot of educational entertainment that keeps you mesmerised, interested and entertained from start to finish. General admission tickets offer excellent value for money at only $26.99 + tax for adults and $20.99 + tax for children. I felt that this was a very low cost in comparison to other attractions in the area, and these tickets offer access to all of the exhibits, one ticket to the 4D XD Motion Theater and one ticket for the ropes course. If you also fancy a fun game of laser tag too, then you can purchase the Laser tag combo ticket at $29.99 + tax for adults and $23.99 + tax for children. It is important to note however that if you plan on going on the ropes course or playng laser tag, then you need to have closed toe shoes on such as trainers, for obvious safety reasons. The exhibits are split into six wonder zones. The first zone we came to was the Natural Disasters Zone. The kids were fascinated to learn about natural disasters that have occurred around the world, and actually took the time to read the information provided. It was great to see something capture their attention as opposed to a quick glance and carry on, and around each piece of information was a hands on exhibit to try out. The first one that my children tried was the Earthquake cafe which was designed to show the power of a 5.3 Earthquake. I found that these kind of exhibits were a real eye opener for the children as we often hear of earthquakes on the news without any idea as to how they actually feel or how scary it must be, and so it definitely got us all thinking. Next we tried out the Hurricane Shack which allowed us to experience a category one hurricane force winds, followed by the Google Earth console which was a huge screen that allowed us to zoom in on any part of the world. My children loved this and were able to find our home, their school, and our hotel that we were staying in. It really is fascinating to see and use the technology that we have available to us. The most interesting part to me in this zone was the Titanic exhibit and actually made me quite emotional. Most people will know the story of the Titanic, and of course many of us will have seen the hit film based on the tragedy. I know the story, I know it hit an iceberg and then tragically sank resulting in the death of many of its passengers, but ive never thought about how cold the water actually was. What temperature were the passengers being plunged into, and what did they have to experience? It really is horrifying to actually think about how it must have been for those onboard, but in this exhibit there is small pool of water that you can put your arm into to experience how cold the water would have been. There is also a timer that records how long you can manage to keep your arm in until you voluntarily withdraw it. I managed 12 seconds which just goes to show how horrible it must have been for the passengers who had no choice but to wait in the water to be rescued. This really gets you thinking and makes you want to learn more. My children asked so many questions after this zone and it was nice to see them so keen to find out as much as they could. The second zone we visited was the physical challenge zone. This zone was so much fun with plenty to do. My husband tried out the bed of nails, and the kids absolutely loved the Wonder Wall which allowed you to create 3-Dimensional images of your body on a giant plastic pin wall. My 3 year old absolutely loved this! The firm favourite in this area though was the Bubble Lab where you could create bubbles of all shapes and sizes. My husband managed to create a huge bubble that my daughter fitted in, and my 3 year old was delighted to be able to make some huge bubbles all by himself. My husband and son also really enjoyed the virtual sports area. There really was something for everyone in this zone. Next up was the light and sound zone. Here we learnt all about the speed of light, colours, patterns, shadows and sounds. Our favourite part of this zone, was the shadow experiment. This allowed you to see your shadow in any shape you wanted to. We stood in front of a wall and then there was a flash, the portion of the wall that our bodies were covering was not able to absorb the light and so this left our shadow impression on the wall. We learnt from this that our image on the wall hadn't actually become darker but instead the rest of the wall had absorbed the light and made the wall lighter. It was a really fun experiment that captured my children's attention and even with the explanation it left them intrigued as to how it worked. Isn't science interesting! Our favourite zone was the Space Discovery Zone, this area was so informative and interesting, and also offered some fantastic photo opportunities. 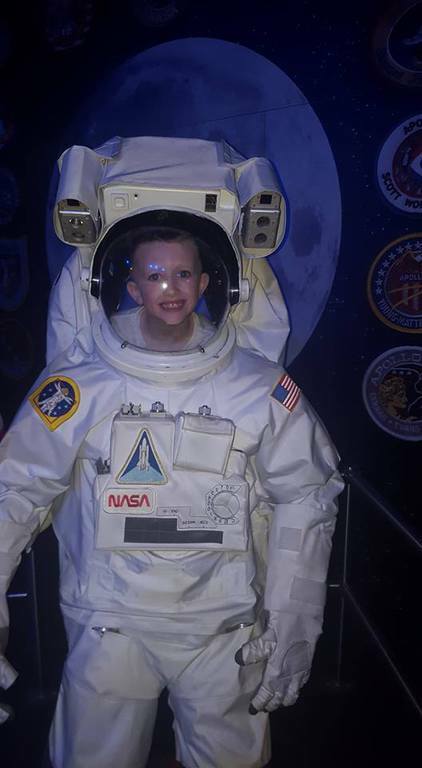 We learnt all about space suits, what they provide to astronauts and how they help them to survive. They really are an amazing piece of equipment and you can have your photo taken inside one which is fabulous. There is also the replica of the Mercury capsule where you can experience what it is like to be inside one of these amazing vehicles. 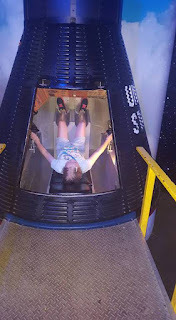 In this area is also an Astronaut training challenge which seats 2 people, and then spins and rotate in numerous directions to simulate the effects that space has on human beings. Having just eaten our lunch prior to our visit though we decided not to try this, but it did look great fun. Don't miss out on the Wonder Coaster in this zone, this amazing simulator actually allows you to create your own dream roller coaster and then experience it in a virtual ride. Really clever! After everything we had already tried, we were expecting the attraction to soon come to an end, as it felt like we had already done so much, but no, there was yet another zone called the Imagination Zone. My youngest son Riley loved it in this zone as there was so much for him to do. A gigantic version of Lite-Brite immediately caught his attention where you could rearrange coloured sticks on to a black wall which would then light up and glow. He created his own little masterpieces that looked fantastic and he was really proud of his efforts. The Fun Express stations also offered Riley some enjoyable digital colouring activities, that are similar to some of the apps that he uses on the ipad and so it was nice for him to be able to enjoy an activity that he was familiar with and knew how to work. I think he could have quite happily sat for hours playing here. When we did manage to get him to venture away from the Fun Express station, he then enjoyed playing with the Gear Works. As he is only 3 he didn't quite understand the purpose of this, but thoroughly enjoyed moving them around and connecting them together, whilst Emma and Ben enjoyed the educational side of it and started to understand how gears work. Last up of the zones was the Far Out Gallery, this wasn't in a large allocated area like the others and instead it was a series of illusions,images and paintings that really got your mind working. These were all situated on the walls on the way UP to the basement, yes that's right UP (remember the house is upside down)! The basement offers even more fun and offers an amazing 3 storey glow in the dark climbing course. My daughter Emma tried this out and it really tested her abilities and also helped to improve her confidence whilst offering enjoyment in a new activity that she had never tried before. My eldest son Ben doesn't like heights and so he chose not to participate in this, and unfortunately I wasn't aware of the shoe policy prior to arrival so due to wearing flip flops I was unable to take part, but Emma really enjoyed it and was so excited and proud of herself when she had finished. The basement also houses the 4D XD Motion Theater experience. The film that showed during our visit was the Canyon Coaster and this offered a simulated thrill ride that we all enjoyed. The ride can accommodate twelve persons at a time and lasts about 5 minutes so we didn't need to queue for very long at all. The Wonderworks website does advertise that there are three different movies shown on a rotating schedule, so if we get the chance to return in the future, it would be great to try out one of the others. Sadly, due to a dinner reservation that we had in Citywalk, we had no time to try out the laser tag. I was quite gutted about this, as I haven't played laser tag since I was about 10 and so I had really been looking forward to this, but we had so much fun in all of the other zones that time had literally flown. The next time we return to Orlando we will definitely be doing this without a doubt as it looked fantastic. If all of that wasn't enough, the basement also has some arcade games, which was really useful to us, as it meant that Ben and Riley could enjoy a few games whilst Emma was on the ropes course and so it was a handy addition to have within the attraction. Overall, we absolutely loved it here. All the staff, from the lady who served us on the ticket desk, to those assisting in the zones were really friendly and helpful. It really is a fun filled attraction from start to finish, that offers excellent value for money, as well as providing a unique learning experience. Would I recommend this place to families? ABSOLUTELY! Disclaimer: I was provided with complimentary tickets for this attraction in exchange for an honest and impartial review.